Thich Nhat Hanh was born in central Vietnam in 1926 with the birth name Nguyen Xuan Bao. At the age of 16 he entered the monastery at Tu Hieu Temple near Hue, Vietnam, where his primary teacher was Dhyana (Meditation) Master Thanh Quy Chan Tiet . 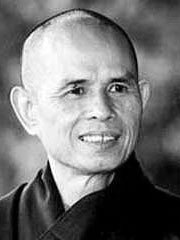 Thich Nhat Hanh underwent a thorough training in Zen and the Mahayana school of Buddhism and received full ordination in 1949. Zen Master Thich Nhat Hanh is now recognized as the spiritual head of that same Tu Hieu Temple as Elder of the Tu Hieu branch of the 8th generation of the Lieu Quan lineage in the 42nd generation of the Lam Te Dhyana school (Lin Chi Chan in Chinese or Rinzai Zen in Japanese). Thầy («teacher» in Vietnamese) Thich Nhat Hanh has combined his deep knowledge of a variety of traditional Zen teaching methods with methods from Theravada Buddhism and ideas from Western psychology to form his approach to modern Zen practice. Thich Nhat Hanh has become an important influence in the development of a western Zen. In 1956 he was named Editor-in-Chief of Vietnamese Buddhism, the periodical of the All Vietnam Buddhist Association. In following years he founded La Boi Press, Van Hanh Buddhist University in Saigon and the «School of Youth for Social Service,» a corps of Buddhist peaceworkers aiding peasants who were caught between warring groups in Vietnam. In 1960, Thich Nhat Hanh came to the U.S. to study comparative religion at Princeton University, and he was subsequently appointed lecturer in Buddhism at Columbia University. In 1963 he returned to Vietnam to aid his fellow monks in their non-violent peace efforts. In 1966 Thich Nhat Hanh was invited to return to the US to lead a symposium in Vietnamese Buddhism at Cornell University. When Thich Nhat Hanh called for a unilateral ceasefire the South Vietnamese government made it clear that he would not be allowed to return home. Subsequently he was granted asylum in France. In 1982 he founded Plum Village Buddhist Center, a meditation community in the Dordogne in the south of France. As of 2005 he heads a monastic community and the lay group, the Order of Inter-Being, teaching the Five and Fourteen Mindfulness Trainings and «Engaged Buddhism.» Thich Nhat Hanh and the Order of Interbeing have also established monasteries and Dharma centers in the United States at Deer Park Monastery in Escondido, California, Maple Forest Monastery, and Green Mountain Dharma Center, both in Vermont. Additionally, there are numerous local sanghas or Mindfulness Practice Groups of the Community of Mindful Living around the world where laypersons meet for meditation, Dharma talks, and Days of Mindfulness. The Vietnamese title Thích means, roughly, «of the Shakya (Shakyamuni Buddha) clan.» All Vietnamese (and Chinese) Buddhist monks and nuns adopt this title as their «family» or surname implying that their first family is the Buddhist community. Neither Nhất nor Hạnh — which approximate the roles of middle or intercalary name and given name, respectively, when referring to him in English — was part of his name at birth. Nhất approximates «first-class,» or «of best quality,» in English; Hạnh approximates «right conduct» or «good nature.» Thích Nhất Hạnh has translated his Dharma Names in the following manner: Nhất = One, and Hạnh = Action. Taken collectively, his Dharma Names are best translated as «One Action». Vietnamese names follow this naming convention, placing the family or surname first, then the middle or intercalary name which often refers to the person’s position in the family or generation, followed by the given name. Thích Nhất Hạnh is often referred to as «Thầy» («master; teacher») or Thầy Nhất Hạnh by his followers. Any Vietnamese monk or nun can be referred to and are often addressed as «Thầy» or «Thầy tu» («priest; monk»). The Miracle of Mindfulness: A Manual on Meditation, Beacon Press, 1999, ISBN 0807012394 (Vietnamese: Phép lạ c̉ua sư t̉inh thưc).